i have a love affair with old paper. 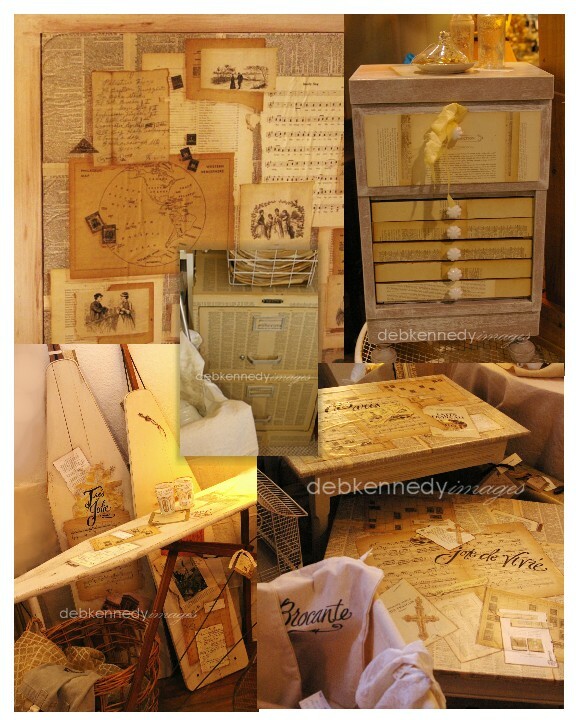 decopauging furniture with collages of vintage paper is a pretty easy project. trust me, you don't have to be 'an artist' to do this! just collect papers, then start applying them onto a clean, dry surface. the two cups, saucer, and brown book are real objects and can be removed. the book page, a sheet of music, and an old letter are decopauged onto the surface. 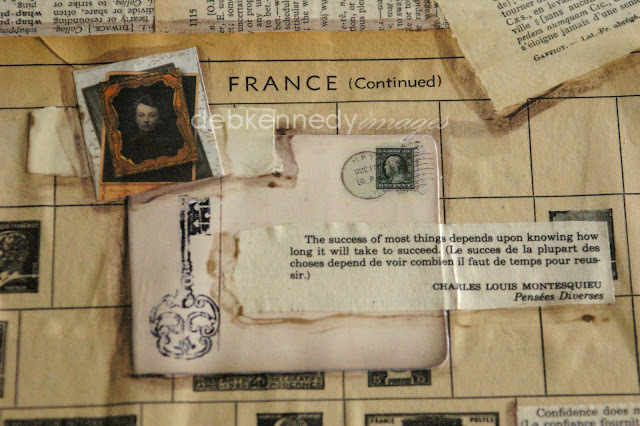 when i collage a project this way, i layer the papers as i work. then i add illustrated pages or postcards, then quotes or verses. and i PAINT on shadows with a thin wash of a brown color paint. this adds dimension to the project, and causes some of the papers to 'float' on the surface. then it all gets sealed with more clear decopauge medium. [and OH do i have a tip for you! don't buy the stuff labeled 'decopauge medium'. go to the paint department in any hardware store. find a gallon of paint that says 'deep tone base' on the label. this is what is used to mix dark colors - black, chocolate, navy, etc. it has NO TITANIUM WHITE in it. the 'paint' inside the can will LOOK white, but it will dry clear. i recommend that you get a semigloss finish. i also recommend BEHR paint. the hardest part of doing this? and that it's NOT a decopauge medium. run from these people! say thank you, pay for your gallon, and leave. and makes previously ugly pieces look interesting and beautiful. 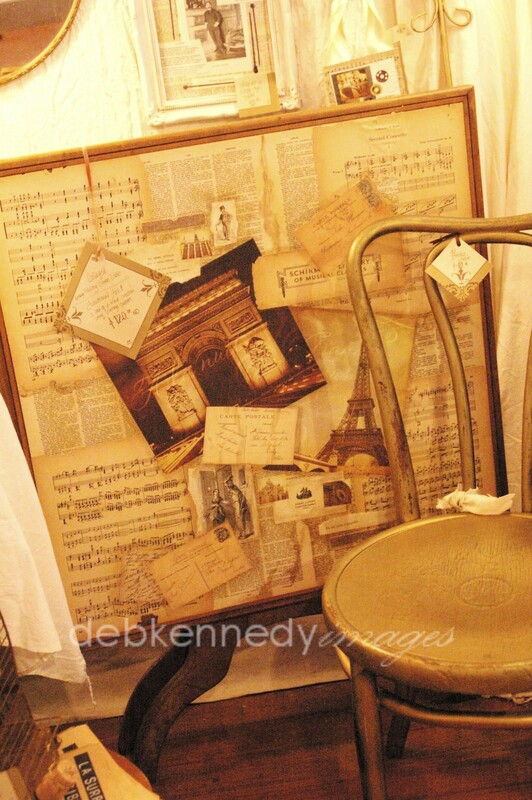 was decorated with a layered selection of Paris-themed papers and music. this enhanced the sense of antiquity and made the table usable again. for our RETREAT booth at the Farm Chicks and Remnants of the Past shows in 2009.
all in all, it represents over 120 hours of work. in a story about the Remnants of the Past show. What an honor! but then again... why NOT? !